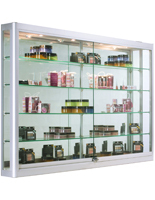 This locking wall retail showcase is illuminated by two recessed 20-watt halogen top-lights. 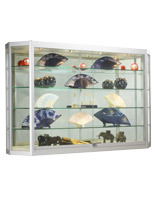 This design allows the spotlights to face forward or backward in the display cabinet for maximum illumination of contents. 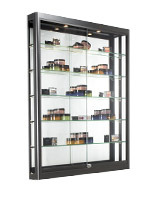 This wall retail showcase is made with impact-resistant tempered glass panes, with adjustable height shelving that rests on rubberized holders for stability and protection. 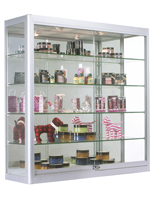 This sturdy, high visibility display cabinet keeps merchandise or other contents secure, thanks to a plunger lock in the sliding doors. 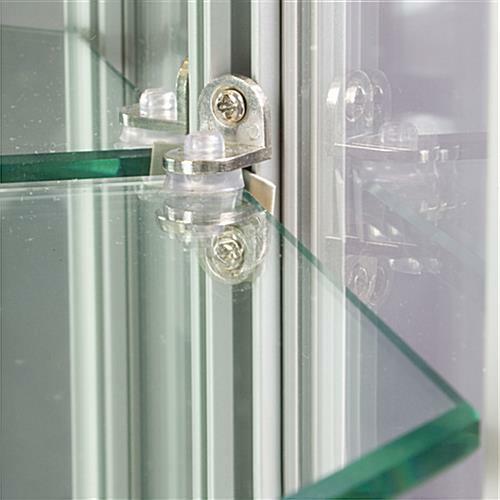 This tempered glass retail showcase is easily anchored to mounting surfaces using the two rugged z-bar brackets included. 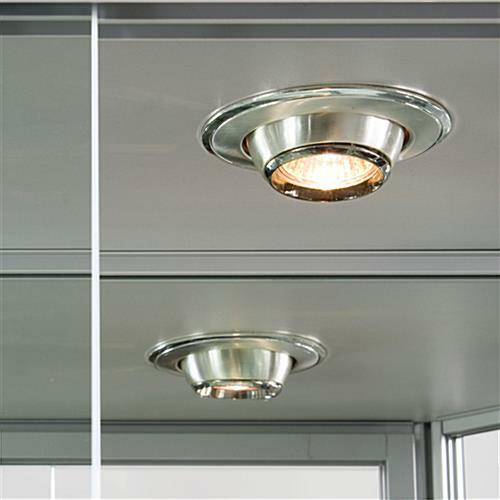 Each 39" wide fixture features a mirrored back for 360° viewing of contents, making it ideal for use in high traffic commercial businesses, stores, galleries, schools, or other public locations. 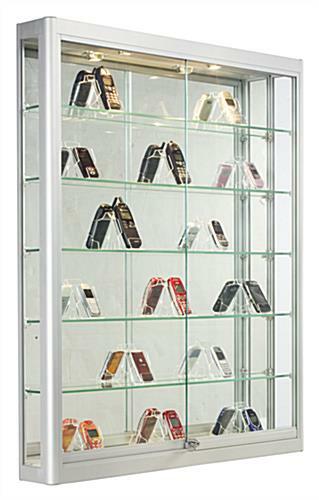 This retail showcase with locking door is a secure way to display valuable contents such as such as electronics, cameras, or cell phones as well as antiques, artwork or collectibles. 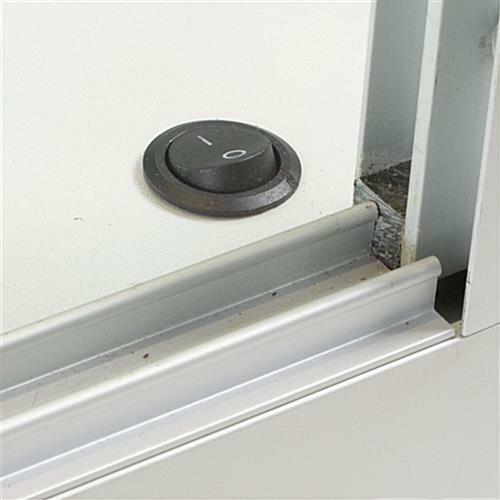 The wall-mounted design saves space, making it a great choice for busy stores or commercial business operations with heavy traffic where floor space is at a premium. 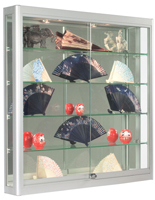 This tempered glass showcase with plunger lock works equally well for jewelry pieces, action figures, artifacts, makeup, eyewear, samples, or sale items. 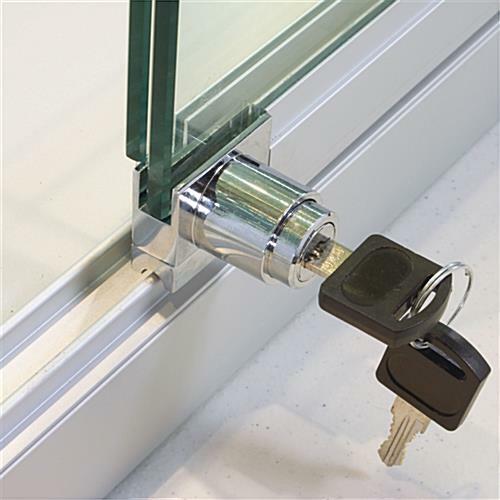 Each fixture ships fully assembled and ready for installation using the included hardware. 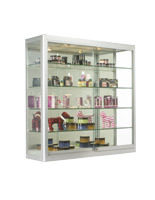 This safety glass showcase with secure access door is ideal for use in retail stores and commercial operations with heavy traffic, such as salons or specialty boutiques, as well as in commercial locations with limited floor space.